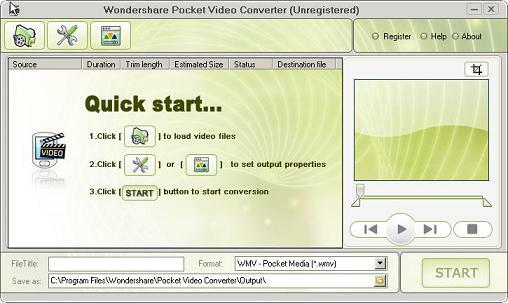 Donwload Wondershare Pocket Video Converter. Wondershare Pocket Video Converter is a powerful video converter for Pocket PC, Smart Phones, Palms, and more mobile devices. The Pocket Video Converter is capable of converting almost all popular video formats such as vob, DivX, XviD, MOV, rm, rmvb, MPEG, WMV, AVI to mobile device format(WMV,WMA,Mp3). All the conversion processes are very easy and fast with high quality. Also, it is combined with more features such as scene capture that makes you enjoy yourself to the fullest with your mobile devices. Pocket Video Converter has you covered: 1. Support almost all kinds of popular video formats. 2. Fast copy video files to Pocket PC, Smart Phones, Palms, etc. 3. Support batch conversion. 4. Support preview. 5. Video Trimming and Splitting. 6. Scene cutting. 7. Particular video/Audio output settings. 8. Easy to Use.